Dieter Schmalstieg is full professor and head of the Institute of Computer Graphics and Vision at Graz University of Technology, Austria. His current research interests are augmented reality, virtual reality, computer graphics, visualization and human-computer interaction. He received Dipl.-Ing. (1993), Dr. techn. (1997) and Habilitation (2001) degrees from Vienna University of Technology. He is author and co-author of over 300 peer-reviewed scientific publications with over 16,000 citations, with over twenty best paper awards and nominations. 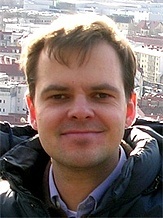 His organizational roles include associate editor in chief of IEEE Transactions on Visualization and Computer Graphics, associate editor of Frontiers in Robotics and AI, member of the steering committee of the IEEE International Symposium on Mixed and Augmented Reality, chair of the EUROGRAPHICS working group on Virtual Environments (1999-2010), key researcher of the K-Plus Competence Center for Virtual Reality and Visualization in Vienna and key researcher of the Know-Center in Graz. In 2002, he received the START career award presented by the Austrian Science Fund. In 2012, he received the IEEE Virtual Reality technical achievement award for seminal contributions to the field of Augmented Reality. He was elected as a senior member of IEEE, as a member of the Austrian Academy of Sciences and as a member of the Academia Europaea. In 2008, he founded the Christian Doppler Laboratory for Handheld Augmented Reality.